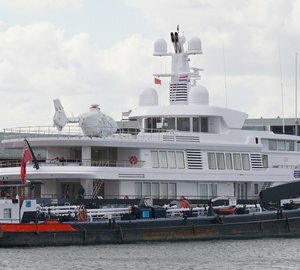 The impressive 104m Lurssen mega yacht QUANTUM BLUE that left the yard at the end of last year, was captured by ‘DiFooll’ on Friday, November 20, 2015, while coming back to her home yard in Lemwerder, Germany. With exterior design by Tim Heywood and interior design by Alberto Pinto, luxury motor yacht QUANTUM BLUE was built to Lloyds Register PYC classification society rules. The steel and aluminium superyacht QUANTUM BLUE boasts an impressive beam of 16,8m (55’12’’). She can achieve an amazing top speed of 22 knots, and can comfortably cruise at 13 knots. Please contact CharterWorld - the luxury yacht charter specialist - for more on superyacht news item "Impressive 104m Mega Yacht QUANTUM BLUE back at Lurssen".